Get a Paytm movie voucher worth Rs. 150, on each transaction (T&C apply). You’ve been asking for it, and here it is! So without further ado, here’s presenting the Official Membership for the 2018-19 season. Join the country’s biggest fan club membership which entitles you to a host of benefits. Merchandise Kit: This year, up our game and give yourself a wide range of products at true value for money which will clearly get your eyes sparkling with joy! Kit includes T-Shirt, Sipper, Book, Membership card, Poster, Keychain & Badge. Screening benefit: Flaunt your membership card & avail CISC entry fee waiver at any 2 screenings in your home city. Up to ₹100 value back in major cities. 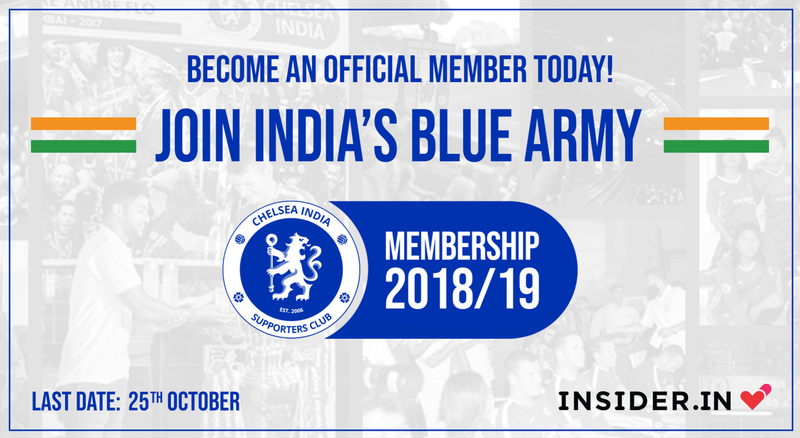 Priority access: Members to get priority access to Chelsea India activities and events. Lucky draw: Straight from Stamford Brigde. Stand a chance to win a Chelsea Football autographed by the entire first team squad. Also, 3 lucky members to win 100% cashback. (Draw to be conducted at the end of the season). Shipping: All kits will be shipped to the respective address (tracking enabled) by the end of November.